MIKE Finn insists he is only halfway to regaining his form despite scooping the £100 top prize at the first Cuestars snooker tournament of the season. Southampton’s 2009 Town Champion (pictured) edged out 12-year-old Shane Castle 3-2 to clinch the first leg on the South of England Championship Tour at Jesters Snooker Club, Swindon. 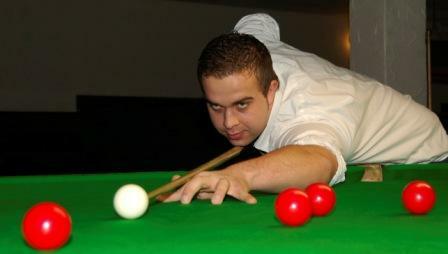 Castle, who is based at Chandler’s Ford Snooker Club, forced a decider with a run of 43. But, trailing by 65 points in the fifth, he missed the black after potting a red and shook his opponent’s hand. Finn hailed his victory as a “good win” and reckons the budding star should now be treated as an equal. “I don’t care that Shane is only twelve because that matters for nothing as he is just a good player,” he said. Finn topped his round-robin group and beat Mark McLean (Churchills, Eastleigh) 2-0 in the quarter-finals. He chalked up a 53 in the first and needed two snookers in the second. In the last-four, he eased past Londoner Ben Finch 3-0. Castle, who pocketed £40, beat his cousin Billy Castle 2-0 in the last-eight and Reading’s David Beakhouse 3-0 in the semis. Ben Tanner (Eastleigh) topped his round-robin group but went out in the last-eight to Beakhouse. Also out in the quarter-finals was Group D winner Ryan Mears (Aldershot) who lost 2-1 to Finch. The second leg of the Championship Tour is at the Ambassador Snooker Club, Poole, on November 21. Shane Castle: 67, 62, 58, 50. GROUP A: 1st, Ben Tanner (The Academy, Eastleigh); 2nd, Ben Finch (Hurricane Room, Walthamstow); 3rd, Ollie Kendrick (Whitmore Reans Conservative Club, Wolverhampton); 4th, Chris Richards (Roath Labour Club, Cardiff); 5th, Dave Volante (Jesters, Swindon). GROUP B: 1st, Shane Castle (Chandler’s Ford SC); 2nd, Mark McLean (Churchills, Eastleigh); 3rd, Adam King (The New Arches Snooker Centre, Coventry); 4th, Lewis Miles (Jesters, Swindon); 5th, Derrick Volante (Jesters, Swindon). GROUP C: 1st, Mike Finn (Woolston Conservative Club); 2nd, Billy Castle (Cue T’s, Marchwood); 3rd, Martin Wallace (Colours, Reading); 4th, Dean Matthews (Ivy Leaf Club); 5th, James Facey (Roath Labour Club, Cardiff). GROUP D: 1st, Ryan Mears (Sovereign SC, Farnborough); 2nd, David Beakhouse (Colours, Reading); 3rd, Kevin Impett (Chandler’s Ford SC); 4th, Gary Bennett (Roath Labour Club, Cardiff); 5th, Wasim Khan (Uxbridge SC); 6th, Thomas Lancastle (Keynsham SC). QUARTER-FINALS (£10): Beakhouse beat Tanner 2-1, Shane Castle beat Billy Castle 2-0, Finn beat McLean 2-0, Finch beat Mears 2-1. SEMI-FINALS (£20): Castle beat Beakhouse 3-0, Finn beat Finch 3-0. FINAL (£100/£40): Finn beat Castle 3-2.